For Mum: Mum likes to cook, especially bake and with fancy gadgets she really gets a going! And I know for sure she'd love this Artisian Mixer in Cream to go lovely in her kitchen and make cakes upon cakes as well as breads and more! For Dad: Dad likes music! And I this is the man who can spend 6 hours in HMV at one time, as he has done many times on our trips to Oxford Street on Boxing Day. I'd love to be able to update him to a new iPod Touch as he likes to carry his collection with him from home to work. For The Siblings: I have 3 siblings at home and as different as they are, and with us all aged between 8 to 24, I thought about a very possible all ages, all round gift for any sibling! We all love a game, so updating the old Wii to a new one with the Wii U would create hours of endless fun. 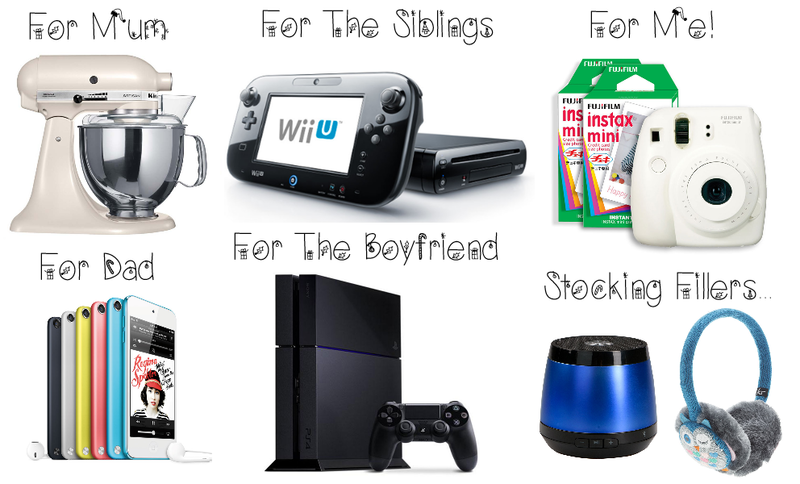 For The Boyfriend: I know the boyfriend would LOVE the new PS4 so of course this is on the gift guide. I wish wish wish I could afford this for him this year, but I may have to wait a little bit before I can gift it to him. It's the perfect present for the man, and this man will love you forever if you gave him one of these! For Me! : I can't forget myself, but I have given myself the cheapest item on the guide (besides stocking fillers). I have always wanted a Polaroid Camera for those special moments. I'm a soppy gal, so I hold on to special moments, and I like the idea of them being captured and non-erasable like they used to be back in the day of film rolls. One of these please? Stocking Fillers: Everyone loves a stocking filler, and a tech one is always going to be a winner. For the boys, how about a little speaker so they can bang out their tunes as and when they'd like. And for us girls, we get cold... So how about a pair of ear muffs with integrated headphones? We'd all love a pair wouldn't we! ?